New York City’s Metropolitan Transit Authority awarded a contract to extend the No. 7 Subway Line one and a half miles between Times Square and the Jacob E. Javits Convention Center. The twin twenty-two foot diameter tunnels were constructed primarily in rock using two tunnel boring machines (TBMs) designed specifically for rock construction. A previously unidentified dip in the competent bedrock made it necessary for the tunneling contractor to perform ground modification to solidify the envelope above the tunnel composed of saturated unstable weathered rock and overburden. Ground freezing was chosen as the safest and most assured method of ground modification to support the hand-mining of the section of tunnel. The rock cover for tunnel CC1 toward the west wall and end wall was less than 10 feet, decreasing with distance towards the end wall where the cover was less than 2 foot at the west wall. Completion of the remaining excavation using drill and blast excavation and bolting was not feasible. In order to safely maintain stability, restrict groundwater inflow and limit settlement of the overlying structures, ground modification and hand mining was performed. 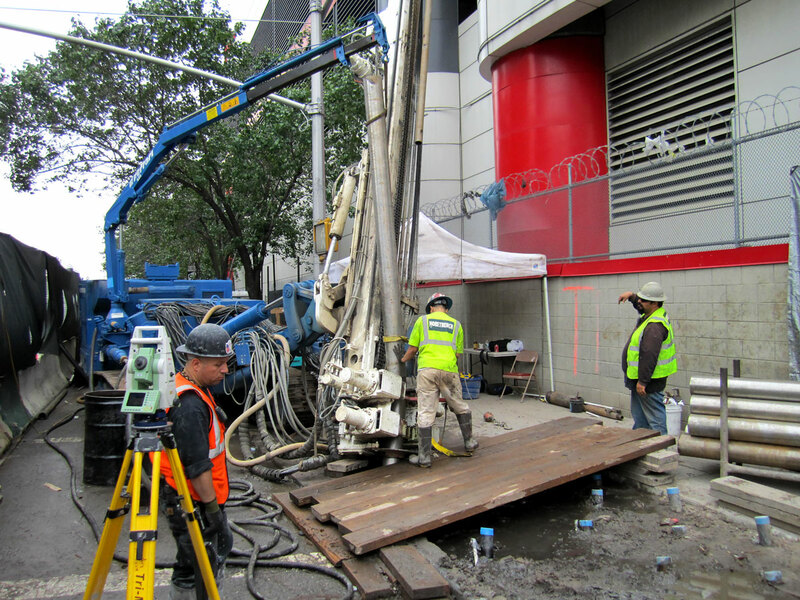 The target ground modification zone was situated directly under Eleventh Avenue and because of the limited street closures and high density of utilities, the work area was restricted to the parking lane and a portion of the sidewalk on the west side of Eleventh Avenue. The ground freeze design incorporated drilling and installing twenty-five angled freeze pipes, field located, to depths ranging from eighty to one hundred and ten feet. The welded steel freeze pipes were installed using a duel rotary drill rig capable of providing the steeply angled cased holes to reach the target zone. On the surface, the freeze pipes were positioned in a two to three foot staggered grid pattern within a ten foot by twenty foot section. The locations were precisely selected to avoid the many utilities that lay under Eleventh Avenue. In addition, three pipes designed to obtain ground temperatures were installed in proximity. These temperature monitors were field located based on the actual freeze pipe alignment. Each freeze pipe was connected to supply and return headers via a custom freezehead. The supply and return headers were piped directly into the refrigeration unit that circulated the coolant calcium chloride brine and delivered it to the freeze pipes, extracting heat from ground. The soil strength in the freeze zone varied with the distance from an active freezepipe and was typically between 400 to 600 pounds per square inch. The monitoring program consisted of daily measurement and graphical representation of the ground temperatures gathered from the three temperature monitor pipes. The monitor pipes were fitted with thermocouples at select depths and were used to record actual ground temperatures at select locations within and adjacent to the freeze area. During formation and maintenance of the frozen ground, the thermocouples were measured on a daily basis to provide assurance of the ground freezing progress. 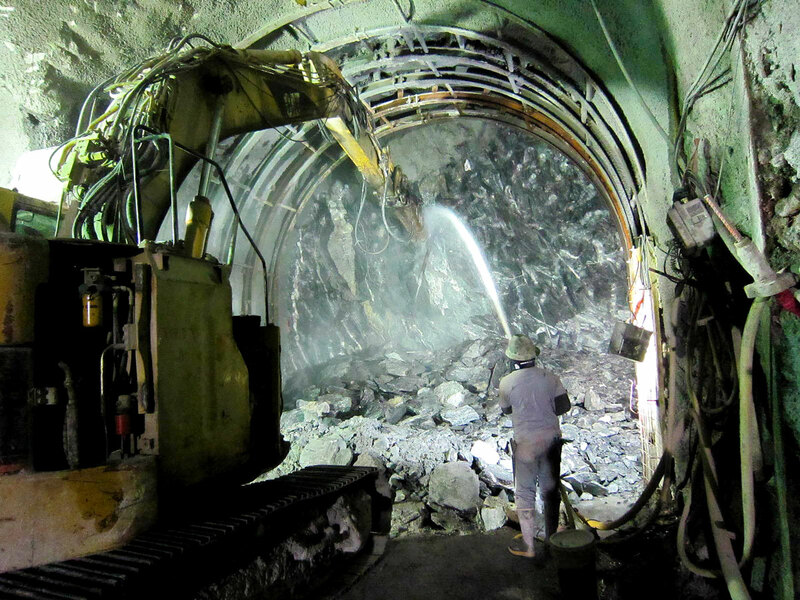 Once the data from the temperature monitors indi-cated the soil mass within the tail tunnel excavation had reached the target temp-erature, the contractor began removal of the rock along the alignment using line drilling and excavator mounted hydraulic hammer. A staged excavation sequence was developed, composed of a series of six five-foot zones. This allowed for a timed deactivation of freeze pipes within the excavation envelope and for installation of rib beams and shotcrete. Upon completion of the work, the ground freezing system was deactivated and the surface components of the system were removed from the site. The freeze pipes were then abandoned by tremie grouting in place.